As an at least partly Irish sort of fellow (my mother’s father’s family), it’s heartening that Americans finally seem to have caught on to the appeal of Irish whiskey. Not to insult Scotch or Bourbon, but Irish has a mellow sweetness that’s awfully hard to resist—or it certainly seems that it’s hard to resist, given we’re drinking about two-thirds more of it than we were a mere five years ago. What makes Irish whiskey distinctive (I can hear my ancestors saying besides the fact it comes from Ireland, ya big eejit?) is that it’s typically a blend of mixed-grain and single-malt whiskies, like a blended Scotch, but is usually distilled three times rather than two; also, the malted barley used for Irish is dried in kilns rather than over peat smoke, so it lacks the smoky, sometimes iodine-y character of many Scotches. I’m not going to get into the whole Jameson’s/Bushmill’s Catholic/Protestant divide, (1) because that way lies madness and (2) because in the end both companies are owned by giant drinks multinationals—one French-based (Pernod-Ricard) and one English-based (Diageo). That said, they’re both perfectly tasty whiskies. If you want to branch out a bit, though, the resurgent popularity of Irish whiskey has resulted in a number of fantastic bottlings on the market. One of the more exciting is the 12-year-old Redbreast Cask Strength ($65), a deliciously rounded, rich, oak-spicy and higher octane variation on one of the most loved (by whiskey fanatics) Irish whiskies around. More affordably, there’s Clontarf 1014 ($21), named for the Battle of Clontarf, a famous brouhaha back in 1014 A.D. between Brian Boru and Máel Mórda mac Murchada, the King of Leinster (Boru won the battle, but died when discovered praying in his tent by one Bródir, who was then himself gruesomely dispatched by the aptly named Ulf the Quarrelsome, who chose to deal with Bródir by winding his entrails around a tree. Bummer for Bródir, to say the least.) Nevertheless, ancient bloodiness aside, Clontarf 1014 is toasty, with light malt notes; a very easy-drinking whiskey. A couple of ounces on the rocks and even Ulf might prove less quarrelsome. Then there’s the Knappogue Castle 17-Year Old Twin Wood ($100) that started off spending about 15 years in bourbon barrels (the standard wood for Irish whiskey) and was finished with 12 months in Oloroso sherry casks. Lots of complexity and depth, with fig, caramel and toasted-nut-sherry notes. At the price, it’s a special-event splurge, but if St. Patrick’s Day isn’t a special event, I don’t know what is. 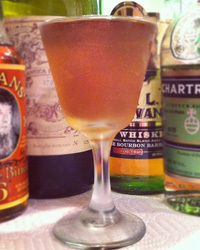 A final thought—if green beer isn’t your thing, you could also celebrate St. P’s day with a Tipperary Cocktail. As written in Harry Craddock’s classic Savoy cocktail book, published 1930, it’s one-third sweet vermouth, one-third green Chartreuse, and one-third Irish whiskey, stirred with ice and strained into a chilled cocktail glass. That ends up quite sweet—personally I’d suggest pulling back on both the vermouth and chartreuse, and making the ratio one-half ounce Chartreuse, one ounce vermouth, and two ounces of Irish. Alternatively, you could mix up an Emerald, a pre-Prohibition variation on the Manhattan: two ounces Irish, one ounce sweet vermouth, and a dash of orange bitters, stirred, straight and served as above. Sláinte!